I love weekend breakfasts, especially weekends that don't involve sled hockey or wheelchair basketball tournaments. That's not to say that I don't like eating breakfast away from home at the tournaments, don't get me wrong, but I do enjoy my spouse and I waking up before the kids, walking the dog, and then fixing a big breakfast for the whole family. I love it when that breakfast comes together quickly! Here's one breakfast that happened not to contain any eggs. 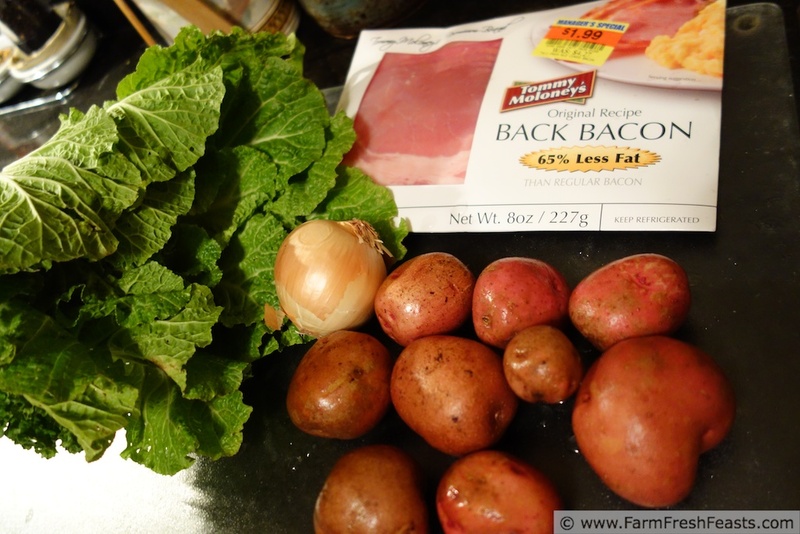 I saw Back Bacon marked down, decided to try it (why not?) and looked around to see what else I could pair with it. 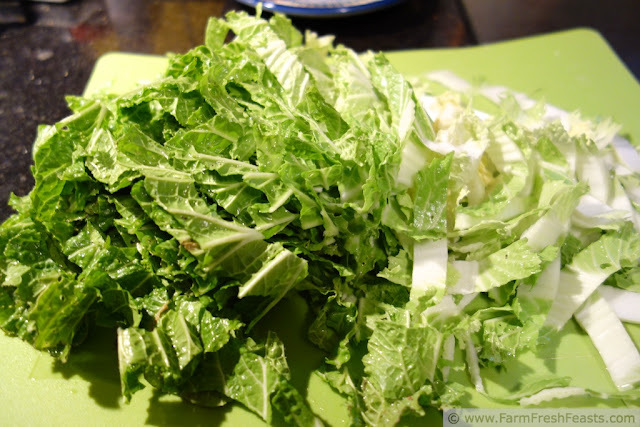 I have Chinese cabbage from the farm share, and I know my family likes that sautéed for dinner, why not try it for breakfast? But there needs to be more to round out the meal. 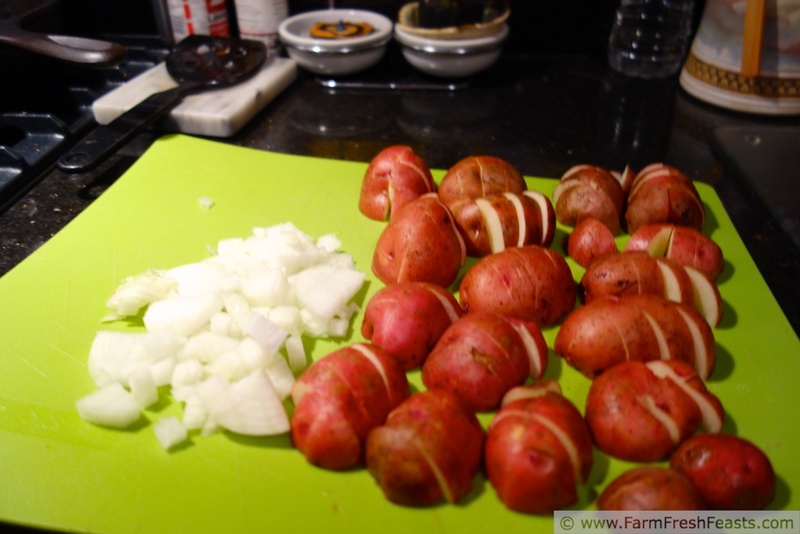 Conveniently, I've also got new potatoes from the farm share, and I know my family likes to eat fried potatoes. Throw all this together, jumping from skillet to skillet, and we've got ourselves a hearty winter breakfast. Plenty of good food to fuel us up for a day in the cold! If you were serving more folks, eggs would be a lovely addition to this spread. But if you're serving folks with egg allergies, consider this combination. It satisfies the appetite of egg eaters and non-egg eaters alike. Preheat 2 large skillets over medium heat, and place half the back bacon in each skillet. Brown on each side, about 8-10 minutes total. Cool, chop into bite-sized pieces, and set aside. Don't wipe out the skillets (grease from the back bacon will have accumulated, let's use this!). Drain the microwaved potatoes and spread in a single layer in your largest skillet (we'll call it #1) over medium-low heat. Sprinkle with salt and pepper, stir to coat with fat, then let the potatoes cook undisturbed for 8-10 minutes. In the other skillet (we'll call that #2), over medium heat, add onions to the back bacon fat. Saute until softened, about 5 minutes. 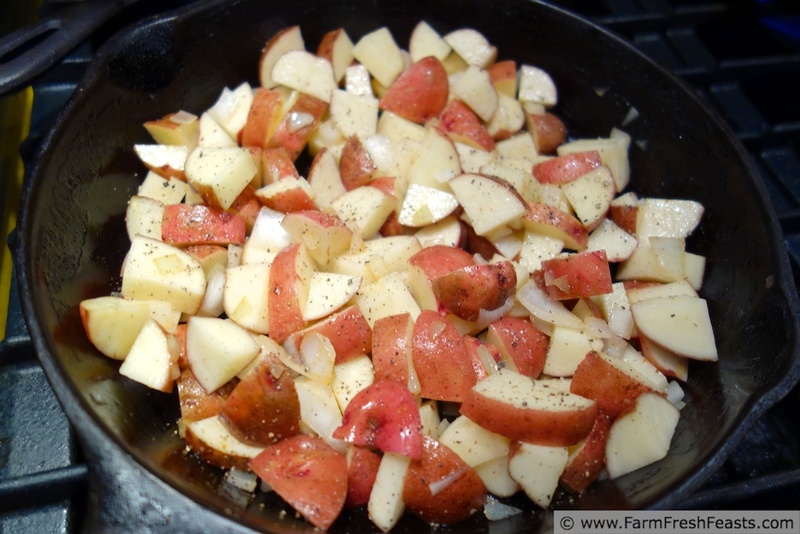 Add half of the onions to the potatoes (in skillet #1), stir to combine, and then leave the potato/onion mixture alone for another 8-10 minutes. 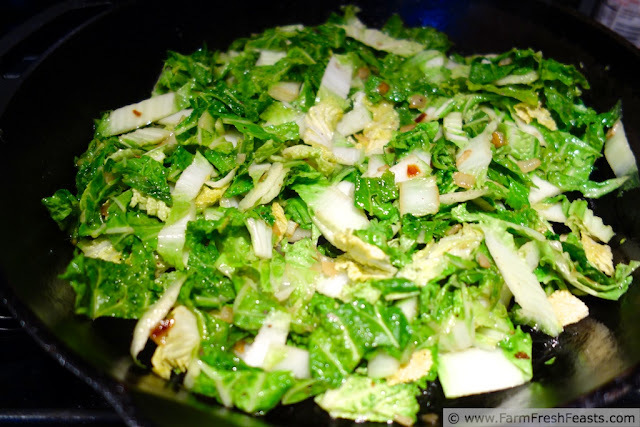 Add cabbage to remaining onions in the second skillet (#2) and sauté until bright green and wilted, about 8 to 10 minutes. Sprinkle most of back bacon over cabbage, fold in. 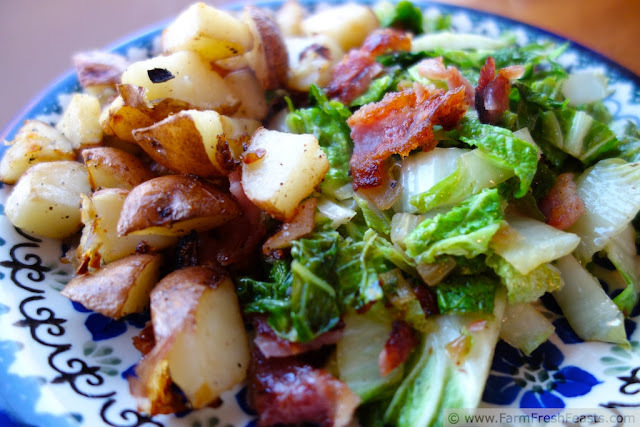 Serve potatoes and cabbage on a plate, garnished with reserved bacon. This post is linked up with What's in The Box at In Her Chucks. Agreed--I could eat this any time of day. I could have this any time of the day. But even better as a midnight last meal if you were out for the evening. I think I'd turn into a pumpkin if I were out late in the evening! But you are on to something--it's got the alcohol taming/grease/salt properties of a midnight hamburger plus cabbage plus bacon! I could definitely see this as a dinner treat! 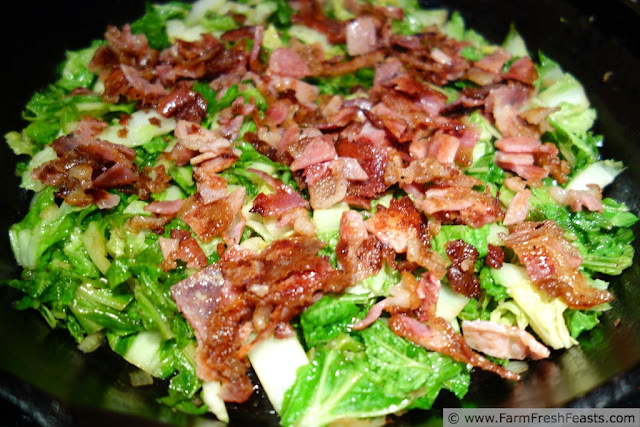 I love the combination of bacon and cabbage of any sort. Have I got a pizza for you! Back Bacon is made from a muscle that runs along the hog's back and is a less streaky cut than the belly meat that we typically call bacon in the US. I included the package in the photo above to show everyone what it looked like in my store. I found it near regular bacon, in the cured meat refrigerated case. Besides the sticker catching my eye, I'd been singing Bob and Doug MacKenzie's 12 Days of Christmas song (day 4: 4 pounds of back bacon) so I figured I'd give it a try. I have always parboiled my potatoes before frying them up, but microwaving them for five minutes sounds so much easier (and less pans to clean). I love this, and I just realized back bacon is the same as Canadian bacon. Yes? I hate cleaning pans, unless I'm waiting for the kettle to boil or the tea to steep or the third pizza to bake and I have nothing else to do. So I'm always looking for shortcuts. 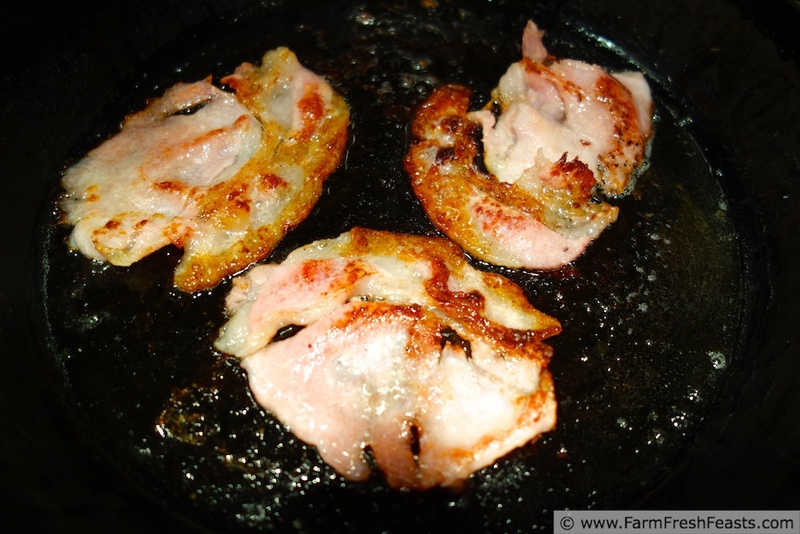 Canadian bacon as we know it in the US is a tidy round piece of meat, and this back bacon is more irregularly-shaped. And more flavorful, IMHO. I just found your blog through Cookin' Canuk. By the way the original way to do the western is no peppers, and with toast, make into a sandwich. I like that there a greens in it. It would also be great with caramelized onions in it. Will be making your breakfast as soon as I get the ingredients. Thanks for the info on the western omelette--unless it's pepper season I rarely have peppers in the fridge so good to know I can make it other ways. I think you're right, caramelized onions would be excellent in this dish. Let me know how it turns out! What you americans call Canadian Bacon, is not really Canadian Bacon. We here also call it back bacon.. If you want REAL Canadian Bacon you buy what we call "Pea-meal Bacon" so called because it is rolled in cornmeal. It is cured but not smoked.. Some people will cook it till it is crisp on either side. I fry it until it is hot but not crisp, just about 1 minute or less either side. That way it is juicy and oh so nice. I like it kind of thick rather than thin sliced, it stays juicier that way. Here in Canada Costco sells it but it is pre-cooked and you just warm it. I prefer to buy it raw and cook from that state, it is just nicer. Some people roast it, but I prefer mine fried with eggs and toast or in a sandwich. You can find it on the internet. It can be a bit pricey, but everyone should try it at least once. You will never go back to what you call Canadian Bacon. The Costco down by sled hockey sells Canadian bacon, but it's nothing like the back bacon. Sounds like there are so many tasty ways to eat it. This dish looks and sounds delicious. I never would have thought to add cabbage to a hash. The next time I go to the grocery store I'm going to buy a cabbage so I can try this. Thanks for sharing. I think mushrooms are the rare veggie that I go seek out in the store. Most everything else I cook with is because it showed up in the kitchen, either from the CSA farm share or the garden! I used Chinese cabbage in this, but I can tell you that my family (esp my daughter) prefer Savoy cabbage over all other cabbages. This looks delish! I just received chinese cabbage for the first time and I LOVE it. Didn't get around to making this dish last week (with traveling and the new meal plan) but I can't wait to try it next time. ps: i am officially on the hunt for back bacon...never heard of it! pps: thanks for sharing and linking up. Look around the bacon in the cured meat/lunch meats area. I confess the mark down sticker caught my eye, but I'm buying back bacon again because it's gooood.